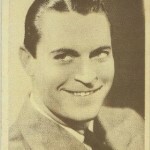 Studio Portraits of Leading Movie Stars issued in 1934 by Lux Toilet Soap. Each measures 9" X 12 inches. Printed on light card stock. Black and white photos framed in white with ornate design in black surrounding. For your Collection! It's sweeping the country. Every one is making a personal collection of these beautiful studio portraits. be sure to include in your collection this fascinating portrait of Fay Wray, star of Columbia's "Black Moon." Promotional envelope claims 33 stars contained inside. 22 different stars have been seen including 4 with two versions of the same film title named; 4 with different film titles promoted on back; 1 with two different poses shown on front. This accounts for 22 different stars; 23 different poses; and a total of 31 different variations of Lux Studio Portraits. We have not yet figured out how to get to the number 33 claimed on the promotional envelope. Lux also issued a similar set of 5" X 7" portraits a year or two ahead of this set. It is worth noting that the envelope containing those smaller sized portraits more clearly states that you will only find 24 different portraits inside the envelope containing an assortment of 50 total. Perhaps the larger set contained only the 22 different stars inside an envelope containing 33 total assorted pieces? Norma Shearer comes in two different poses, each advertising The Barretts of Wimpole Street n back. Image donated by a collector who also submitted all variations in checklist following below. See complete text checklist below the gallery. None at this time ... check my eBay listings for any available Lux Premiums . As these 9" X 12" portraits were slightly larger than my scanner the edges are cropped on all of them. For full view see the photo of the Norma Shearer variations above. All 22 known premiums are shown with two examples of the reverse side included as well. Note: U.S. release date (month year) following each title and/or additional notes.